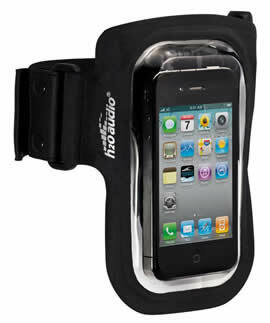 The H20 Audio Amphibx fit waterproof iPod Touch case armband is the latest waterproof large iPod solution. It allows you to use your iPod Touch features whilst remaining waterproof. The cleartouch window allows for operation of the iPod interface. Waterproof headphones (not included) allow you audio access. 100% Waterproof iPod Touch Case Solution. Removable Versatile Adjustable Velcro armband fits most arm sizes. It Floats! Even with the iPod Touch inside and armband attached the Amphibx Fit will float. The waterproof Amphibx fit armband case fits all iPhones (inc iPhone 5), iPods, MP3 Players, and Phones.